Ramona High School was opened in 1956, and graduated it’s first class in 1958. More than 30% of each graduating class applies to, and is accepted into 4– year colleges and universitiies, and more then 50% of each graduating class attends a 2 year community college. Ramona also boasts a nationally acclaimed band that has been featured in major motion pictures, television & commercials worldwide. Ramona has been designated as a “National Demonstration School” for the AVID Program and hosts visitors from around the world.Ramona High School is home to the largest campus in Riverside Unified School District covering 55 acres, and has a stadium and full-sized performing arts theatre. Looking for a solution to offer access to content and assignments offline on any device a student may use. Ensure a partnership that provides the highest level of pre and post-sales consulting and technical support. Unparalleled partnership and after-sale service and support. The good news is that a lot of content is available via the internet. The bad news is that not all students have internet access. Intelligent Papers provides the solution for those students that do not have internet access outside of school. It allows them to store and modify content and assignments offline on any device they may have. Once a student is within wireless range of the internet it ‘syncs’ up their work. Intelligent Papers accomplishes this action by caching the content. It will “take a picture” of all the content on the schools online system that pertains to the student. 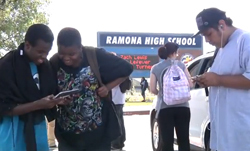 Ramona High School Administrators wanted their students to take ownership of their own device and their education. Therefore, in addition to school provided devices for the students, students are permitted to bring their own device to use at school. Intelligent Papers will work on all major mobile technology operating systems and devices. Ramona High School now has over 2100 students using devices instead of textbooks which provides access to a variety of resources with the use of Intelligent Papers. Students take the devices with them everywhere giving them access to 24/7 learn-ing. Taking notes are easier and students do not lose them. Integrated video allows instruction to go with the student, parents are empowered to assist and the student can read the chapter or handout as many times as they need too.